I took last week off from the blog. I am determined to continue sharing a verse every week for the rest of the year, but I’ll admit I’m losing some of the steam I started out with. I felt kind of bad for dropping the ball on my verse-a-week challenge, but the reason I didn’t post was that I was involved in our church’s vacation Bible school. We were also hosting a super-cool day camp that rolls into town with inflatable slides, archery, 9-square and all kinds of other games, decorations, and (most importantly) endlessly energetic college-aged counselors. The day camp age range is 7-12, which leaves our kids ages 3-6 with nothing to do. So we put on a morning VBS for them, and I was so happy to be a part of it. I taught the Bible portion and enjoyed introducing the kids to each day’s theme: God is real, God is love, God is forgiving, and God is forever. We were able to really get into God’s love for his creation, the story of Jesus, and the complete gospel. So it’s not like I wasn’t meditating on the Word or the character of God! Over the years I have seen that God works in my heart whenever I teach the Word to others, even the youngest of children. Last week was a workout for my mind as I tailored the lessons to suit our unique group of kids. The curriculum we used was great, but as we got going it became clear that our kids already had a lot of background knowledge, so I included more of the gospel message and tried to encourage the kids to connect the dots of what they already know. I also had to rely on God for the energy to do this! We were competing with the sounds of day camp floating into our classrooms and wanted our kids to feel special, too. But God came through as he always does, and we had a great week (actually 4 mornings) with the little ones. 12 Put on then, as God’s chosen ones, holy and beloved, compassionate hearts, kindness,humility, meekness, and patience, 13 bearing with one another and, if one has a complaint against another, forgiving each other; as the Lord has forgiven you, so you also must forgive. 14 And above all these put on love, which binds everything together in perfect harmony. These verses tell us some important things about God, but also some important things about us. First, God, because he always gets to go first. He chooses us! And his choosing us makes us holy and beloved. So he is holy and he is loving. His choosing us also empowers us, information that we have from earlier in this chapter, like verse 1, “If, then, you have been raised with Christ” or verse 5, “Christ who is your life,” and of course from elsewhere in the New Testament when we learn from Jesus and his apostles that it is God’s power at work in us, enabling this change of character, empowering us to “put on” this long list of noble traits. Just yesterday I had the honor of teaching some 3- to 5-year-olds about this very concept through the story of Peter and John healing a lame man. But we see this lesson in the Old Testament, as well, in every leader God ever chose for his people from Abraham to Moses to David to Solomon… every king, every judge, and every prophet… human strength is insufficient for the call to holiness. It is our holy and loving God who enables his people to be holy. He does not call us only to leave us dangling from the thread of our own incomplete strength. This is the character of our God, and what sets the Christian faith apart from others: God comes to us and provides everything we need to obtain righteousness. He did this once by sending Jesus the Son to live a perfect life, die a sacrificial death, and give salvation and righteousness to all who accept him; God continues to provide us with his Spirit so we can work out our salvation and share the truth of God’s redemptive love with others. Now, us. We always get to go after God. 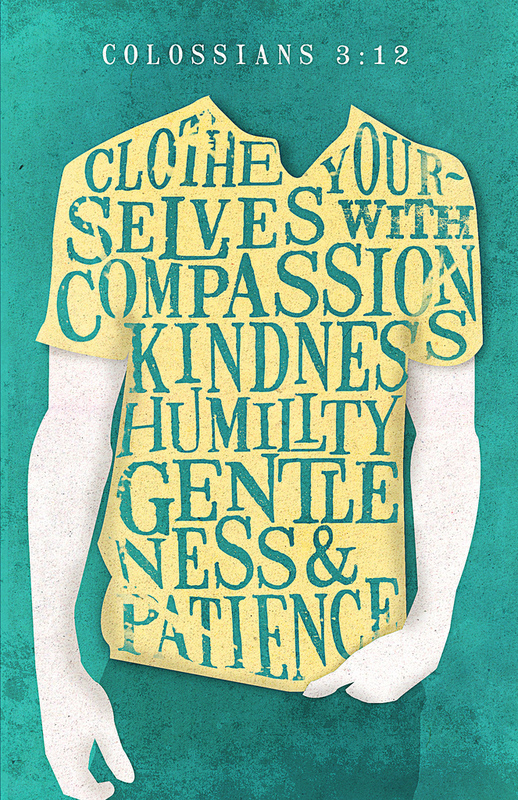 We are to put on compassionate hearts, kindness, humility, meekness, patience, and forgiveness. When I look at my own life I’m tempted to think I’m doing okay with compassion and kindness and patience, growing in humility, and pretty forgiving overall. But do I really allow for opportunities to forgive, as this verse calls me to? I don’t know. And I don’t think I’m alone. How many times do we as Christians brush our “complaints” under the rug in order to avoid conflict? Or live with the sinking feeling that we may have wronged someone? We endure the feeling until our paths just don’t cross anymore and we can keep our minds occupied with other things. The Bible calls us to live at peace with one another, but is simultaneously calling us to deal with our conflicts so we can practice forgiveness. I think we have bought the lie that we’re at peace if we don’t bring things up to our brothers, but in reality we are not at peace, we are living in a state of un-forgiveness, and our holy God has given us clear and strong words about refusing to forgive. I don’t quite know what to do about this. I know I need the Spirit to renew my mind, heart, and actions in this area; and that will be a focus of prayer this week as I look at (and listen to) this passage. I took a minute to read all of Colossians 3 while I was writing, and I would encourage you to read it, as well. It contains so much good teaching on living the Christian life! How do these verses challenge you? You are a busy gal! You do bring up a conundrum we all face, especially those of us who dislike confrontation. Thanks for your honesty!